The Calibir uncooled Long Wave Infrared camera platform offers outstanding shutterless imaging performance and is optimized for Size, Weight and Power (SWAP). As a first member of the Calibir family, the Calibir 640 series introduces an easy-to-use modular design with a 29 mm x 29 mm x 29 mm camera core that can be integrated into tight spaces for compact solutions. The Calibir 640 series features shutterless operation and rapid image output on power up while delivering uniform response over the entire operating temperature range, making it ideal for thermal imaging applications requiring uninterrupted image acquisitionn. 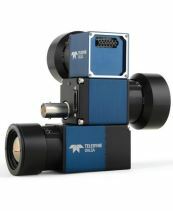 For greater flexibility, the Calibir 640 series microbolometer-based platform supports a variety of industry standard video formats, physical interconnects, LWIR lenses and state-of-the-art onboard processing engine. The Calibir 640 series is ideal for a wide range of imaging applications requiring long wave IR detectors in the field of surveillance and monitoring, defense and security, maintenance and general machine vision.